Scheduling is available. Please build your schedule now. In its sixth year, NVSBE directly connects Veteran Owned Small Businesses (VOSBs) with Procurement Decision Makers (PDMs) from the Department of Veterans Affairs, other federal agencies, state government, as well as large commercial firms with small business needs. NVBSE continues to prove as the most effective way to directly connect VOSBs with potential buyers in the federal and commercial marketplaces. "The National Veterans Small Business Engagement (in 2015) proved to be another successful event…the event succeeded in connecting VA Procurement Decision Makers with Viable Small Business Contractors from across the globe." 378 PDMs attended NVBSE in 2015. Veteran Owned Small Businesses have the opportunity to directly engage with PDMs through a myriad of activities such as Business Opportunity Sessions, Networking Tables and Dining with Decision Makers Luncheons. 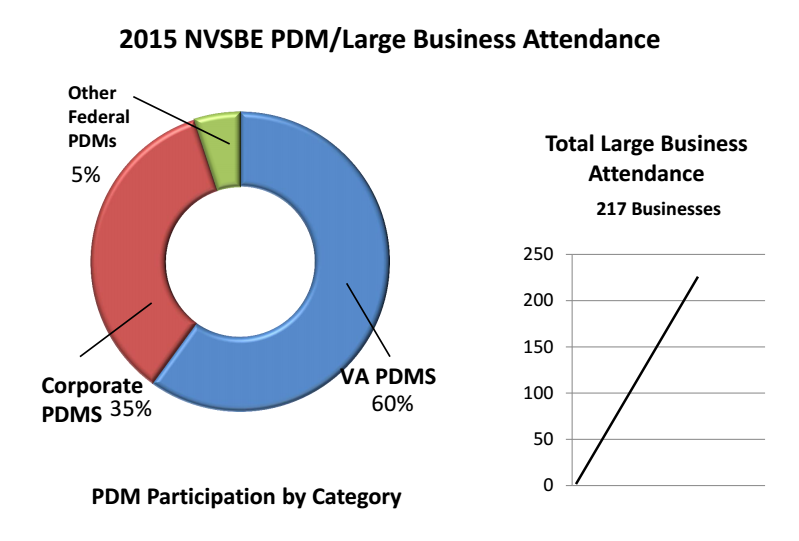 Eighty-five percent (85%) of 2015 attendees reported connecting with 1-20 PDMs during NVSBE. In 2015, sixty-five percent (65%) of small businesses learned about procurement opportunities that their business is currently able to fulfill. 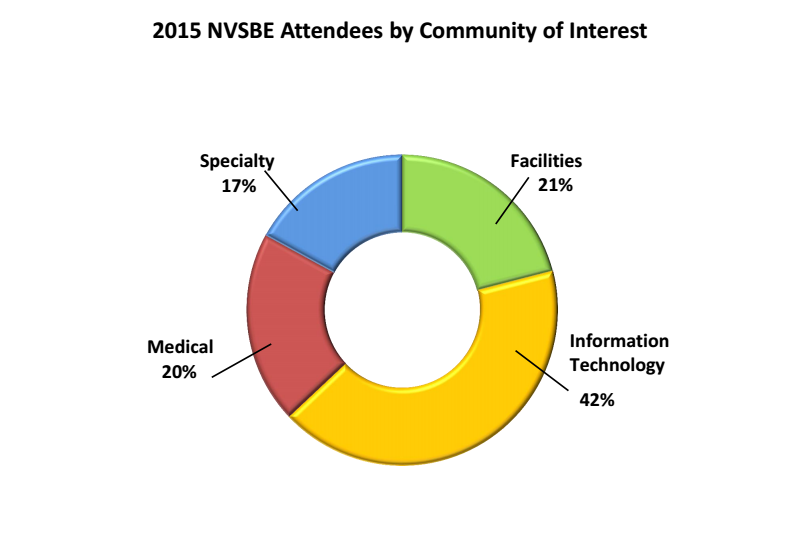 Fifty-eight percent (58%) plan to submit proposals for contracts they learned about at NVBSE. 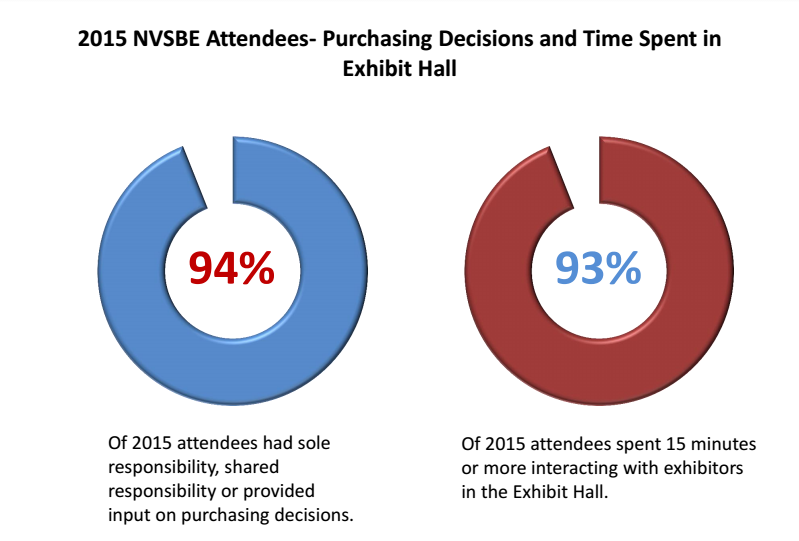 Eight-hundred and eighty-one (881) VOSBs attending the NVSBE from 2011-2014 have received more than $2.8 billion in contract obligations. Overall, $1.3 billion in contracts have been awarded to procurement-ready Veteran businesses as a result of NVSBE. NVSBE participants have many opportunities to directly engage with VA leaders and PDMs. Sixty-three percent (63%) of 2015 attendees said their access to VA PDMs met or exceeded their expectations. Seventy-three (73%) of all Veteran businesses said they feel that the VA procurement community works on their behalf and shares their concerns. 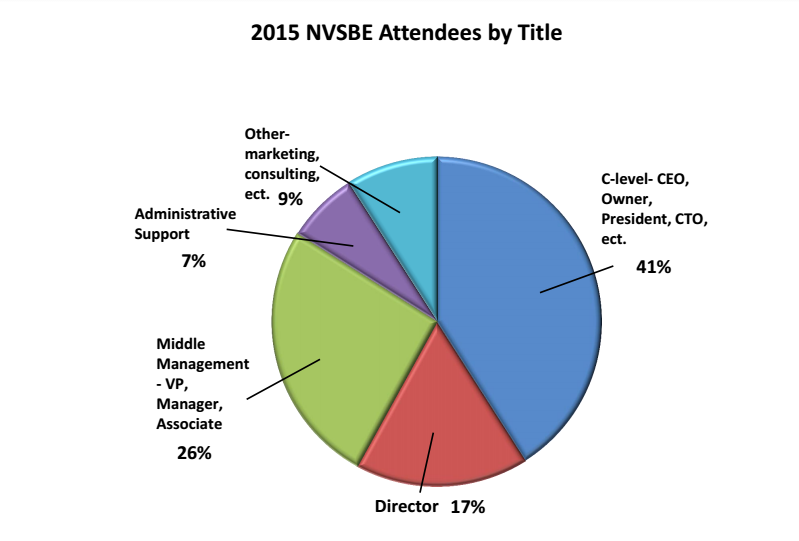 More than 3,235 people—including 1,432 VOSBs—attended NVSBE in 2015. Participants have the opportunity to network with other Veteran owned small businesses in their industry to discover subcontracting and teaming opportunities. Eighty-four percent (84%) of businesses reported making 1-20 new and valuable connections at NVSBE. Sixty-three percent (63%) said that connecting with small businesses had the greatest potential ROI for their organization. Upload organizational logo, files, briefings, etc. The 2016 National Veterans Small Business Engagement (NVSBE) is scheduled for November 1-3, in Minneapolis, MN. NVSBE directly connects VOSBs with PDMs from the Department of Veterans Affairs, other federal agencies, state government, as well as large firms with small business needs—and provides training opportunities to improve the capabilities of small businesses to successfully compete for procurement contracts. As a VA-verified SDVOSB/VOSB, you are essential to the success of VA as it pertains to securing procurement opportunities. It is important that you know how the Kingdomware decision will affect you and your responsibility as a VOSB with the procurement process in the future. Specifically, VA must give contracting priority to qualified SDVOSBs and VOSBs, while not empowering pass-throughs and opportunistic entity formations. SDVOSB and VOSB contractors must acquire that ability to deliver high-quality, responsive and responsible offerings to VA’s mission, without being exploited by a historically predatory vendor community. The simplest solution to this challenge, that meets the needs of all Stakeholders, is for these Stakeholders to embrace the proven system that was leveraged toward assisting the Government at Large, in exceeding the 3% SDVOSB and 23% SB spending goals (i.e., a goal that the SBA has consistently attained since FY 2010). The law and policy based solution that will be addressed during this session focuses on teaching attendees how to leverage and maximize SDVOSB and VOSB Joint Venturing, which is a solution that was approved under both PL 106-50 and 108-183. “Certified? Now What?” As we all know by now, compared to getting the business, certification is the easy part. How do we leverage certifications to secure actual contracts and other business opportunities? You go to all of the outreach events, you talk to EVERYONE, but still there seems to be a disconnect between the excitement about the opportunities and actually experiencing business growth in the form of a contract award or a genuine business relationship resulting in a win-win. 2016 is the year of CHANGE and taking ACTION to get your firm to the next phase. This session is designed to help you build-out a strategy to move you closer to a contract award and the development of a true, value-added business relationship with commercial firms. Responding to RFPs is only a very small part of getting the business. The first thing that large business teaming partners want to know is “if I do business with a new company, what’s in it for me?” What is the return on my investment of time and other resources? How do I mitigate risk? Learn how to have the right conversation by breaking down the business reasons that make sense for others to do business with your company. This session will highlight the enhancements instituted with the MyVA Verification application process. The resources made available to Veterans prior to submitting an application (initial or reverification). Network Contracting Office (NCO) 19 is proud to host a forum on the supplies, equipment, and services needed to open the new Denver VA Medical Center. NCO 19 will award multiple contracts for various supplies, services and equipment. This forum is only open to registered NVSBE attendees. 2016 NVSBE Learning Sessions cover a host of topics, specific to three tracks: Business Development, Doing Business with Federal Agencies and Commercial Companies, and Advanced Procurement Strategies. Over three days, participants gain expert advice on both federal and commercial procurement processes and learned techniques to help grow their business. Learning Sessions strengthen knowledge of procurement readiness by allowing experts to share their expertise and real-world strategies with VOSBs. Sessions will last 45 minutes with time for questions. T4NG - Is Your Business Ready? WIRED! TO BID OR NOT TO BID? Is Your Capability Statement Hurting You? The Ostensible Subcontractor Rule – "That’s How They Getcha"
Since joining VA, Secretary McDonald has led the Department in its ambitious transformational journey to be a world-class service provider and the No. 1 customer-service agency in the Federal government giving Veterans consistent, high-quality experiences. That undertaking began with reinforcing the importance of VA’s inspiring mission to care for those “who shall have borne the battle,” their families, and their survivors, and re-emphasizing VA’s commitment to its I-CARE Values of Integrity, Commitment, Advocacy, Respect, and Excellence. The Department’s MyVA vision—its catalyst for change—is the framework modernizing VA’s culture, processes, and capabilities. To put the needs, expectations, and interests of Veterans and their families first—and put Veterans in control of how, when, and where they wish to be served—the MyVA vision is improving the Veteran experience, improving the employee experience so employees can better serve Veterans, improving internal support services, establishing a culture of continuous improvement, and enhancing strategic partnerships. Over the course of his tenure so far, VA has expanded Veteran access by focusing on staffing, space, productivity, and VA Community Care; continued to drive down the disability claims backlog; and progressed toward an effective end to Veteran homelessness by focusing on proven prevention and treatment services and Veteran homelessness programs and thanks in large part to unprecedented partnerships and vital networks of collaborative relationships across the Federal government, across state and local government, and with both non-profit and for-profit organizations. The Secretary is personally committed to values-based leadership and to improving the lives of others. He and his wife, Diane, are the founders of the McDonald Cadet Leadership Conference at West Point—an annual gathering that brings together the best and brightest young minds from the best universities around the world and pairs them with senior business, NGO, and government leaders in a multi-day, interactive learning experience. The recipient of numerous leadership awards and honorary degrees, in 2014, Secretary McDonald was awarded the Public Service Star by the President of the Republic of Singapore for his work in helping to shape Singapore’s development as an international hub for connecting global companies with Asian firms and enterprises. Secretary McDonald and his wife are the parents of two grown children, and the proud grandparents of two grandsons and one granddaughter. Greg Giddens was appointed as the Principal Executive Director for the Office of Acquisition, Logistics and Construction at the Department of Veterans Affairs (VA) on April 8, 2015. He previously served as the Executive Director of VA’s Office of Policy and Planning, Enterprise Program Management Office (ePMO). His career in civil service began at the Warner Robins Air Logistics Center as an engineering and logistics manager, followed by an assignment as program manager at Wright-Patterson Air Force Base in Ohio. Mr. Giddens also held the Deputy Director and Director positions for all Air Mobility Command training programs within the System Program Office. Before joining the Department of Veterans Affairs, Mr. Giddens held various roles including: the Director for the Department of Defense Acquisition Personnel Demonstration Project, Program Manager for the United States Air Force Weather Weapon System, Deputy System Program Director for E-3 Airborne Warning and Control System, Deputy Assistant Commandant for Acquisition at the United States Coast Guard (USCG) Headquarters, and the Deputy Program Executive Officer for the Integrated Deepwater System for USCG. Mr. Giddens was reassigned to the Department of Homeland Security (DHS) in October 2005 to stand up the DHS Secure Border Initiative (SBI) office and held that position until October 2006 when he became the Executive Director for the SBI Program Executive Office (PEO) within Customs and Border Protection and then the Executive Director for Facilities Management and Engineering in October 2008. He was selected to be a member of the Senior Executive Service in 2000 and has received several awards including the Presidential Rank Award for Distinguished Executive in 2005. Mr. Giddens holds a Master of Science in National Resource Strategy from the Industrial College of the Armed Forces, a Master of Business Administration from Georgia College, and a Bachelor of Science in Electrical Engineering from Georgia Institute of Technology. We are pleased to offer group room blocks at a wide variety of downtown Minneapolis hotels for NVSBE participants to accommodate all preferences: the Hyatt Regency Minneapolis (Headquarter Hotel), Hilton Minneapolis, Millennium Hotel Minneapolis, and Minneapolis Marriott City Center are our Official “Engagement” Hotels. – all offering NVSBE 2016 discounted group rates, and an extensive array of restaurants to fit all tastes and budgets, numerous shops and stores, and cultural and historic attractions. The hoteliers are thrilled to have the opportunity to serve and honor the men and women who are America’s Veterans as well as the companies and Federal agencies that support them. They will not only offer deluxe sleeping accommodations at the government rate but a myriad of value-added amenities such as complimentary in-room Wi-Fi, Business Center, complimentary on premise fitness center, on site restaurants, and much more! At this time, the official NVSBE hotels are now sold out. Individual hotels may have one or two days open, but no hotel has availability for the entire stay of the conference. We do anticipate additional rooms, on a limited basis, to become available between now and the conference. We suggest you check daily with each hotel. We are planning to add additional hotel offerings in the next few days. These hotels will be offered at a discounted rate, but they are not official conference hotels providing the discounted conference rate. Scheduled transportation is not being offered between these hotels and the convention center, although some hotels may be within walking distance. Reference codes, online reservation links and toll-free phone numbers to make reservations are listed under the individual hotels below. You also have the option of going to www.nvsbe16.com to register for the event and select the Hotel Tab in the navigation bar to make your hotel reservations. Reservations can be made until our hotel group room blocks are filled or on or before the cut-off date Tuesday, October 10, 2016 (whichever occurs first). Reservations after the cut-off date are based on availability and may be at a higher rate. Minneapolis - St. Paul International Airport (MSP) is conveniently located 15-30 minutes away from downtown. There are several ground transportation options from the airport to the Minneapolis Convention Center and NVSBE hotels. Service is available at both terminals. Terminal 1-Lindbergh: Taxi service at Terminal 1-Lindbergh is accessible via the Tram Level (Level T). Signs direct passengers’ one level up to the taxi starter booth, where airport staff will assist passengers in obtaining a taxi. Terminal 2-Humphrey: At Terminal 2-Humphrey, taxi service is available at the Ground Transport Center, located on the ground level of the Purple parking ramp directly across from the terminal building. Fares: Downtown Minneapolis is approximately 12 miles from the airport, with fares averaging $39-$49. A $6.75 fare will be displayed on the Taxicab meter at the onset of your trip. This fee includes a $2.50 flag drop and a $4.25 airport access fee. Ticket counters are located in the Terminal 1-Lindbergh Ground Transportation Atrium, accessible via the terminal's Tram Level. Follow the signs to the appropriate escalator or up-elevator. Advance reservations are highly recommended. Shuttles drop off travelers near the Green and Gold parking ramps across from the Lindbergh Terminal. From there, you can take an escalator or elevator down to the terminal's Tram Level or up to a skyway to Ticketing. Trains stop at both Terminal 1-Lindbergh and Terminal 2-Humphrey and connect travelers to 17 other destinations, including downtown Minneapolis to the north and Mall of America to the south. Frequency: Trains run every 10 minutes during peak hours and typically every 10 to 15 minutes at other times of the day. From the airport, trains can take you to Mall of America in about 12 minutes and to the Warehouse District in downtown Minneapolis in about 25 minutes. *Be sure to check the light rail schedule at www.Metrotransit.org if you plan to utilize this service. Fares: Tickets are sold at ticket machines at the rail stations. Light rail fares for adults are $2.25 during rush hours (Monday through Friday, 6 - 9 am and 3 - 6:30 pm) and $1.75 at other times. Reduced fares are available for seniors, children and persons with disabilities. Children 5 and under ride free (limit 3) when accompanied by a paid fare. Inter-Terminal Travel: Use the LRT to travel between airport terminals. There is no charge for rail service between MSP’s terminals. Service between the terminal buildings is available as an alternative to LRT for passengers with mobility challenges and those with special needs (e.g. physical limitations, elderly, parent with young children and baggage). Uber in St. Paul, Minneapolis has 4 Uber car types ready to pick you up. The Uber fare rates are updated daily. Use the Uber fare estimate to get an estimate on your next Uber ride. Parking is easy to find at the conveniently located Minneapolis Convention Center. Across the street from the MCC is an underground ramp that is connected by a climate-controlled skyway system to the MCC and several downtown accommodations and attractions. Within easy walking distance of the MCC there are a dozen parking ramps, most connected to the MCC by skyway. Anne Imrie Senior Director Buchanan and Edwards, Inc.
Akhil Handa Director of Operations By Light Professional IT Services, Inc.
Lucy Donahue Senior Vice President By Light Professional IT Services, Inc.
Mike Farahbakhshian Senior Director of Business Development By Light Professional IT Services, Inc.
Rich Beaudoin Associate VP of Federal Healthcare By Light Professional IT Services, Inc.
Rick Falls Senior Director of Business Development By Light Professional IT Services, Inc.
Steve Kastin Chief Medical Officer By Light Professional IT Services, Inc.
Phuong Mai Sr. Principal Business Technology Architect CA Technologies, Inc.
Tina Orr Manager Supply Diversity and Management CBRE, Inc.
Kevin Degnan Director CGI Federal, Inc.
Jennie Williams Supplier Diversity Program Manager Cox Communications, Inc.
Robert Missroon Vice President - Finance, CFO DSS, Inc.
Denise Thompson Account Manager DSS, Inc.
Michelle Zabella Senior Account Manager - West Region DSS, Inc.
Mark Byers CEO DSS, Inc.
Brooks Banton Director of Government Affairs DSS, Inc.
Hardy Faison Central Region Account Manager DSS, Inc.
Bob McCormick National Sales Manager DSS, Inc.
Lynda Joseph Director DSS, Inc. Rob Gill Region 3 Account Manager DSS, Inc.
Joseph Byers VP Sales and Marketing DSS, Inc.
James Trompeter Strategic Account Manager DSS, Inc.
Jeanne Pflaum Account Manager - Central Region DSS, Inc.
Paul Smith Government Account Director Johnson & Johnson Health Care Systems, Inc.
William Deeb Director, Federal Healthcare | VHA, Corporate Accounts Karl Storz Endoscopy - America, Inc.
Richard Strchen Manager, Federal Healthcare | VHA - West Karl Storz Endoscopy - America, Inc.
Brad Dillard Manager, Federal Healthcare | VHA-East Karl Storz Endoscopy - America, Inc.
Kreg Ackman Territory Manager L&R USA Inc.
Sue Powell RHIA Federal Healthcare Program Manager Nuance Communications, Inc.
Joan Bishop Sr. Account Executive Optum, Inc.
Hemang Shah Director PETNET Solutions Inc.
Dania Vega VA Quality Improvement Manager Rotech Healthcare Inc.
Laura Mills Sr Joint Commission Specialist Rotech Healthcare Inc.
Eric Brown Business Development Manager STG International, Inc.
Elham Ramirez Program Manager, Clinical Operations STG International, Inc.
Verification Town Hall: This session will highlight the enhancements instituted with the MyVA Verification application process. The topics discussed will include: An overview of the steps an applicant takes to start the verification or reverification process; the two step process for submitting required business documents; submitting a change to information regarding the firm’s status; the one-on-one interaction between assigned CVE staff members who will assist each applicant; identification of issues earlier in the application process; the options available to firms which have difficulty meeting the program requirements as required in 38 CFR Part 74; and the resources made available to Veterans prior to submitting an application (initial or reverification). Cancelation of registration: You may request a refund of your registration by written notice no later than September 23rd, 2016. A $150 cancelation fee will apply. No refunds will be granted after September 23rd, 2016. Any business/organization seeking to discuss specific or general procurement opportunities with large companies, corporations and government agencies. VA Employee that is hosting a business opportunity session, networking table, or a learning session.